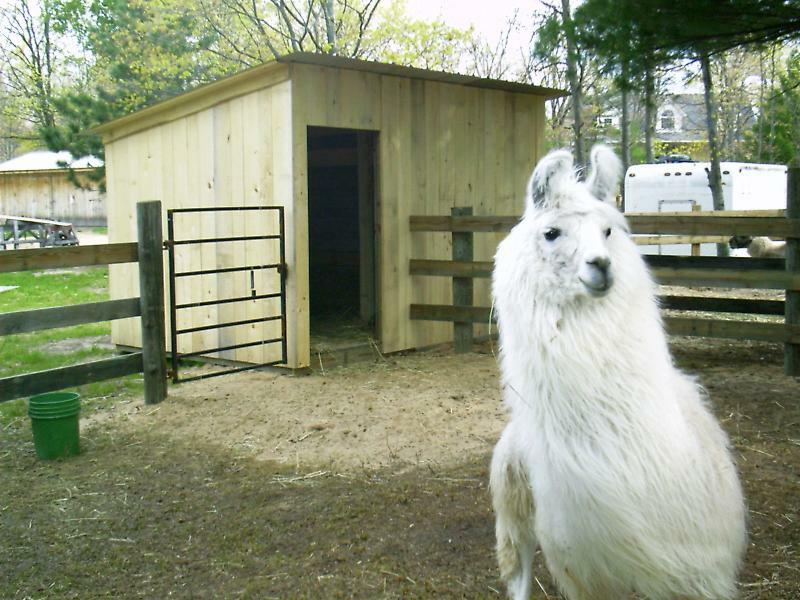 This llama shelter is designed to house two different stud males. One animal enters at this end to move inside, a solid wall separates the two males and prevents any problems. A second male is housed on the other side of the shelter. This designs saves money and space!! The boys like their living quarters as well. The floor is made of solid wood and this particular shelter can be picked up and moved to any other location. It is not built at this location as a pemanent fixture (saves on property taxes too). 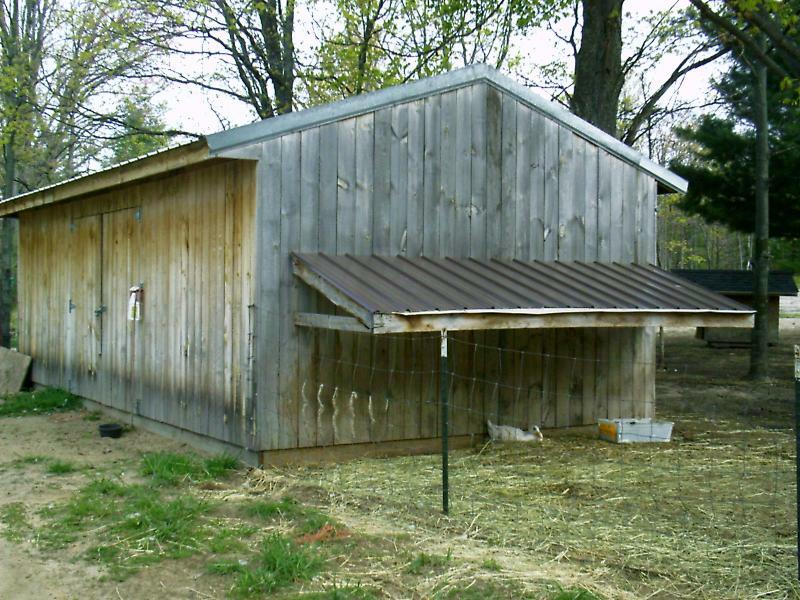 This larger barn (12x24) was originally built to house goats and sheep. The inside is separated into two different large stalls and has a sliding rear door for easy entrance and exit. The lean-to on the side permits animals to stay out during more inclement weather (notice mamma duck likes it for her nest). This barn has a dirt floor, but sizes, shapes, and specifications can be made to suit your needs. These are just two samples of structures that Jason has built. He can build according to your needs and wants, for animals big and small. Call him at (231) 944-5313. Jason creates many different styles of larger barns and smaller shelters for a variety of different animals. He can create what you need for your dog, birds, goats, llamas, horses, or other livestock depending on your needs. To get information on building, please call Jason at (231) 944.5313 or send an e-mail. 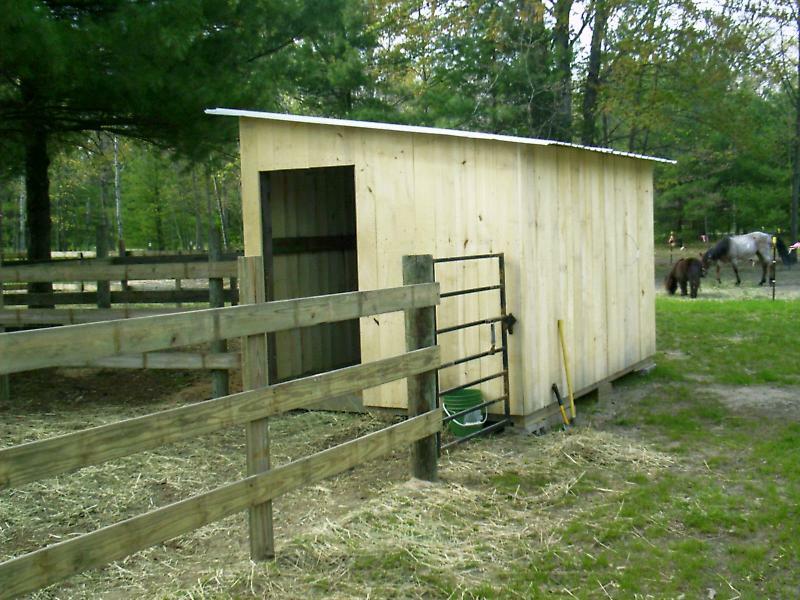 Jason wil be glad to return your call, discuss your needs, and help you create the barn/shelter that will best suit your needs. All building/shelters are completed by individual quotes and contracts. Jobs may be quoted either hourly or by the job depending on the individual project. Price lists are calculated prior to the projects beginning. Call today and get your free quote. Jason has been doing carpentry since 1986 and does all sorts of jobs. There are houses all over the state of Michigan that Jason has built/been part of and several in the Traverse City area incuding our own home. Jason has been building for livestock since we started our first farm in New Lothrop, Michigan in 2000. He is conscious of animals and their specific needs including animal safety when building. He enjoys creating new and innovative creations for people and animals both.